Storing the stamps we use is only part of a stamper’s storage challenge. We also have to figure out efficient storage for the art mediums that we use with the stamps — like markers and paints. You’ve got to put them someplace where they are accessible. But you also need to consider each art medium’s unique storage needs. Most of my markers and paints are stored in these two IRIS desktop storage units. 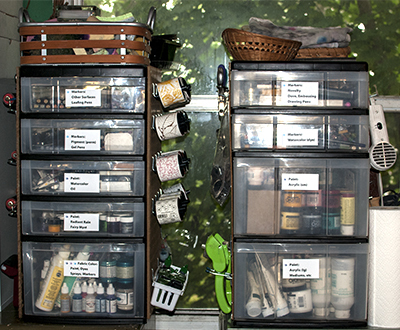 (The exceptions are spray cans of paint, varnish and fixatives, some stamping paints that I keep in another drawer unit and alcohol ink markers that I keep near my work area.) Why do I store markers and paints this way? The plastic drawers of these units suit these art mediums. 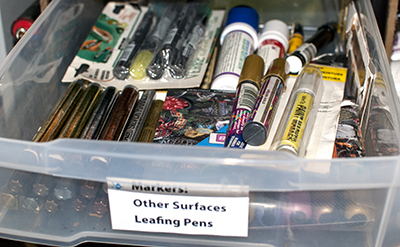 Many of my markers are either dual-tip markers or are still stored in their original flat boxes or plastic packaging. Dual tip markers tend to do best if they are stored flat so that the ink doesn’t all settle in one end, leaving the other dry. And flat marker sets store well in drawers. They can be stacked if needed but can also be removed easily. They do well in fairly shallow drawers. Paints, on the other hand, are often in bottles or tubes that do best standing up straight. Paint comes in all kinds of containers from little one-ounce jars to large tubes and jars of acrylic paint and mediums. A plastic drawer unit with a variety of drawers of different heights lets you match the paint to a suitable drawer height. While I always try to keep paint lids on tight, if I goof and there is a spill, the paint puddles inside a plastic drawer, minimizing the mess. Of the nine drawers in these two storage units, four are used for marker storage (the top two drawers in each unit) and the remaining five are used for paints. Rather than have all my markers in one giant jumble, I’ve divided them by type. The first drawer is Other Surfaces and Leafing Pens. These include markers that work on glass or ceramic or wood. I don’t get into this drawer often, but I know where to look when I need these types of marking tools. 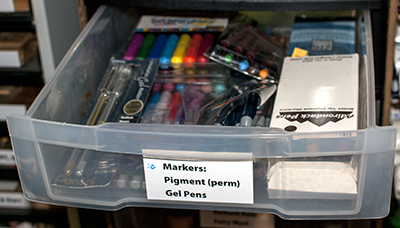 The next marker drawer holds Pigment Ink Markers and Gel Pens. Most of these are sets still in their original boxes/cases so they are easy to pull out when a project requires them. The Watercolor Dye Ink Markers is probably the marker drawer I get into the most. It is in the unit right next to my work area. I’ll admit that this drawer is a jumble. I’ve got a zillion markers in there and I really need to go through them all and cull out the ones that are past their prime. This drawer is removable so if I need to poke through it to find a specific color or use a bunch on one project, I can pull the whole thing out. 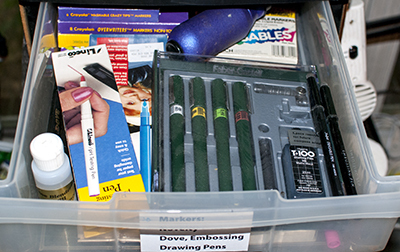 The last marker drawer is an odd mix of Novelty Markers, Dove Blenders, Embossing Pens and Drawing Pens. I’ve also got a Dove Blender refill bottle in there and a marker blow tool. The paints are also divided by type. This drawer has Radiant Rain and Fairy Mysts. I don’t know why, but periodically one of the Radiant Rain bottles will decide to suddenly leak. It is then that I really appreciate the plastic drawers. 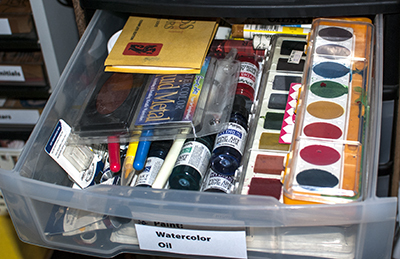 The next paint drawer is Watercolor and Oil Paints. The paints in this drawer are pretty much stacked in the drawer, so I need to move things to get to things in the bottom of the drawer but I don’t use these all that often. 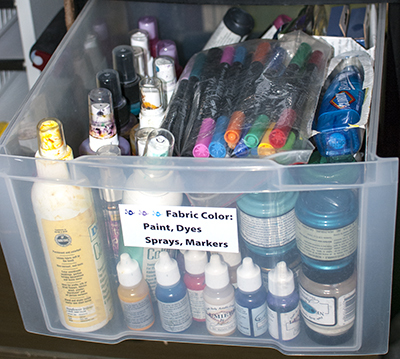 My mediums for coloring fabric get the biggest drawer. This one has Fabric Paint, Fabric Dyes, Fabric Sprays and Fabric Markers. The fabric markers are in two zippered plastic bags sitting on top. They are easily lifted out to get access to everything else in the drawer. If I worked on fabric more often, I would probably split the contents of this drawer out between two drawers, but I don’t, so they all live together in one drawer. 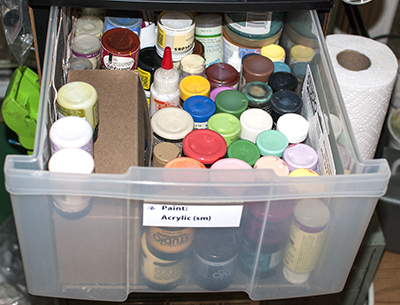 The final paint drawer has Large Acrylic Paint Jars/Tubes and Acrylic Mediums. Most of these need a deep drawer because they are tall but a few are stacked. Again, these are mostly stored upside down. Many of the mediums are about the same white or off-white color, so I used a black Sharpie to write what they are on the bottom of the bottles. So this is how I store most of my paints and markers. It might seem like a lot of drawers, but I’ve accumulated a lot over twenty some years of stamping. I’ve found that over-stuffing plastic drawers doesn’t usually work well. Let them get too heavy and even fairly sturdy plastic drawers can start to sag. And if you put too much in one drawer, they get hard to pull out and you can’t find anything in them any way. So I divide them out to distribute the weight and make things easy to find. How do you store your markers and paints? Thank you Nancie for the tip…on my way in a minute to turn all my Acrylic paints upside down!!! 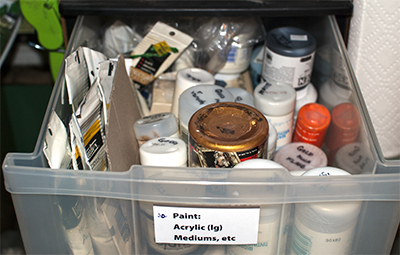 I store my various markers by type with each type in a ‘Lock-n-Lock’ plastic container so I can grab the type of marker I need – all containers are labeled…these are stored above the washer/dryer on a shelf in my Studio (see Nancie’s last post). 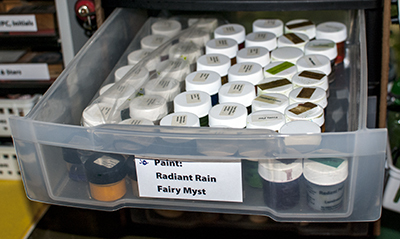 My acrylic paints are also in a Large plastic container with a lid that has a handle and stored in the garage. Everything is handy according to how often used. You and I have the same idea when it comes to storage of markers and paints! To help with not having chaos in the marker drawer, I have placed them by colours, company or type into plastic containers I kept from Stampin’ Up. I stack those in the drawers, then I only grab the type I need for the project I’m working on. LOVE these posts! Hugs!